As Christmas is just around the corner and free time gives way to prepping for the holiday, gaming often takes a backseat....at least for me. This week's Frugal GM Review is going to be as short, which is in-line for the item being reviewed. In this case it is Combat Accelerator from 10 Spot Games. This 3 page (including the cover) PDF is nothing more than an idea being put forth to speed up combat. 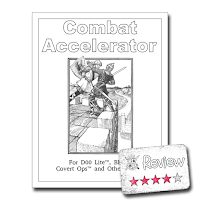 Since my favorite RPG is HackMaster, speeding up combat feels like a cardinal sin, but I can totally see where the ideas put forth in Combat Accelerator could be useful. I actually picked up this free supplement with the thought of tweaking it for use with a play-by-post game where the emphasis is more on roleplay than intense combat.